Two linear equations with 2 unknowns. This is a simple problem to solve. Note that this is still a simple problem to solve. The first two equations are identical to the previous example. You can use those first two equations to solve for x and y. Then, knowing x, you can solve for z. The central point is that the third equation is not important for determining the value of x. The first two equations are sufficient to solve for x and y. This is precisely how the benchmark New Keynesian model deals with money. The baseline New Keynesian model does not include money. The model is complete and a solution exists. Subsequently, to examine whether money would be important in the model, a money demand function is added to this system of equations. There is a solution to the model that exists. Money is then shown to be irrelevant in the determination of the other variables. But, then again, so was z.
UPDATE: I have updated the post to read “benchmark New Keynesian model” to reflect the fact that some have attempted to integrate money into the NK model in other ways, specifically through non-separable utility. This is, in fact, where I am going to take this argument in the future. Nonetheless, for now, see the excellent comment by Jonathan Benchimol below with some links to his related research. 1. The central bank responds to a positive output gap by tightening monetary policy. 2. Inflation is caused by positive output gaps. Well, if identification is the problem, then I have a solution. During the period from 1745 to 1772, Sweden’s central bank, the Riksbank, issued an inconvertible paper money. What we would now call monetary policy was carried out through discretionary means. For example, the Hat Party, which controlled the Riksdag and the Riksbank from 1739 to 1765, expanded the bank’s balance sheet in an attempt to increase economic activity. However, while monetary policy was determined through discretion, there is no evidence whatsoever that the central bank used countercyclical policy. In fact, the Hat Party explicitly thought that monetary expansions would boost economic activity. The closest thing to a countercyclical policy occurred when the Cap Party took over and reduced the money supply in an attempt to bring down the price level. However, they did this so dramatically that any good advocate of the Phillips curve would believe that this would result in a negative output gap and deflation such that the relationship would still hold. So, what we have here is a period of time in which the identification problem is not of any significance. As a result, we can have a horse race between the quantity theory of money and the Phillips Curve to see which is a better model of inflation. 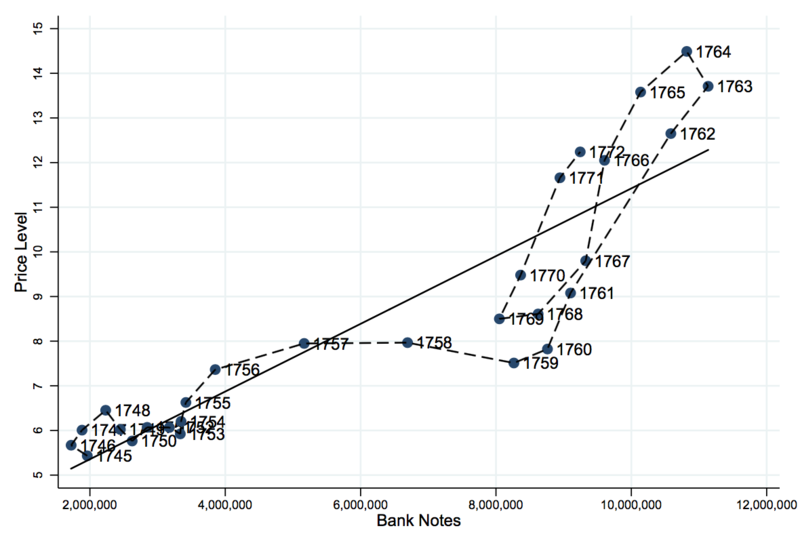 Here is a figure from my recent working paper on the Riksbank that looks at the relationship between the supply of bank notes and the price level from 1745 – 1772. The solid line represents the best linear fit of the data. This graph seems entirely consistent with the quantity theory of money. Now let’s look at a Phillips Curve for the same period. To do so, I construct an output gap as the percentage deviation of the natural log of real GDP per capita from its trend using the Christiano-Fitzgerald filter (the trend is computed using data from 1668 to 1772). 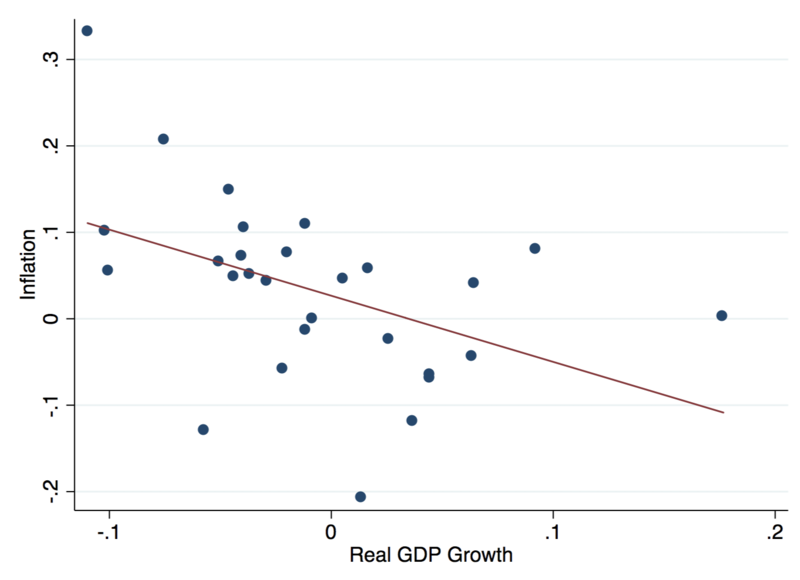 Here is the scatterplot of the output gap and inflation. Hmmm. There doesn’t seem to be any clear evidence of a Phillips Curve here. 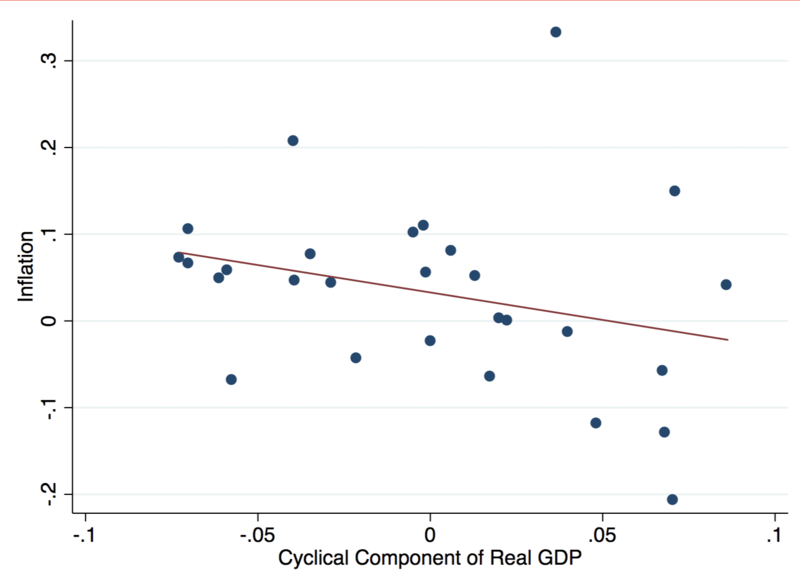 In fact, note that the relationship between the output gap and inflation should be positive. Yet, the best linear fit is negative (but not statistically significant). Maybe its the filter. Let’s replace the output gap with output growth (a proxy for the output gap) and see if this solves the problem. Hmm. The Phillips Curve doesn’t seem to be there either. In fact, the slope is steeper (i.e., going in the wrong direction) and now statistically significant. So here we have a period of time in which the central bank is using discretion to adjust the supply of bank notes and there is no role for countercyclical policy. The data is therefore immune to the sorts of identification problems we would see in the modern world. In this context, there seems to be a clear quantity theoretic relationship between the money supply and the price level. And yet, there does not appear to be any evidence of a Phillips Curve. Tariffs have been in the news lately. As is typically the case, economists have come to the rescue on social media and op-ed pages to defend the idea of free trade and to discuss the dubious claims that politicians make about protectionist policies. I have no quarrels with these ardent defenses of free trade (although I would note that claims about the supposed importance of New Trade Theory and New New Trade Theory and claims about the global optimality of free trade are potentially contradictory; perhaps economists don’t like NTT or NNTT as much as they claim, but I digress). Despite my general support of free trade, I also think we should take a step back and try to understand the motivations of politicians who embark on protectionist policies. In addition, I think that we should start with the basic premise that politicians are rational (in the sense that they have some objective they want to pursue and their actions are consistent with such a pursuit) and potentially strategic actors. In doing so, we might obtain a better understanding of why politicians behave the way that they do. Once upon a time, this type of analysis was referred to as public choice economics. What follows is a short attempt to do so. 1. We will refer to the country of analysis as the Home country and a trading partner as Country X. 2. Country X has imposed trade barriers on the Home country that are costly to a particular sector in the Home country. 3. Free trade is unequivocally good and is the long-run goal of all of the politicians in the Home country (I make no assumptions about the goals of Country X). Given that Country X is imposing a costly trade restriction on an industry in the Home country, the politicians in the Home country would like to reduce this trade restriction. They could try to negotiate the trade restriction away. However, if the Home country does not have trade restrictions of their own that they can reduce, they do not have much to offer Country X. As a result, the Home country might impose trade restrictions on Country X. By doing so, the Home country might be able to induce Country X to reduce their trade restrictions in exchange for the Home country getting rid of its new restriction. So what is the basis of this claim? And why would politicians do this given the assumption that I made that free trade is unequivocally good and therefore all trade restrictions are bad? Here is my answer. Without having trade restrictions on Country X, the Home country does not have anything to bring to the bargaining table to induce Country X to reduce trade restrictions (setting aside other geopolitical bargaining). So the Home country needs to create a bargaining chip, but the bargaining chip needs to be credible. For example, one way to create a bargaining chip would be to impose trade restrictions on Country X. However, for this to be a credible threat, these restrictions have to be sufficiently costly for the Home country. In other words, politicians in the Home country have to be willing to demonstrate that the trade restrictions imposed by Country X are so costly to the Home country that the politicians are willing to punish Country X even if their own constituents are harmed in the process. By demonstrating such a commitment, they now have a bargaining chip that they can use to negotiate away trade restrictions and end up with free(r) trade in the long run. At the same time, politicians in the Home country cannot broadcast their strategy to the world because this would undermine their objective. So the politicians will likely adopt typical protectionist rhetoric to justify their position. The problem, of course, is that this is not a foolproof plan. Once the Home country imposes trade restrictions on Country X, this could turn into a war of attrition. If the Home country is not willing to commit to these trade restrictions indefinitely, then they might eventually unilaterally remove these restrictions without any benefit. Not only that, but by doing so, Country X might now see this as evidence that they can impose additional trade restrictions on the Home country without subsequent retaliation. So make no mistake. This sort of policy can be a gamble because it requires winning a war of attrition. However, some politicians might be willing to make that gamble in order to achieve the long run benefits. Throughout the 17th and early 18th century, Sweden had a significant empire in northern Europe. In 1700, an alliance of Denmark-Norway, Russia, and others attacked the Swedes. While Charles XII, then the king of Sweden, had initial success against this alliance, he was eventually wounded and the Swedes never really recovered. Charles died in 1718. Charles had taken power at the age of 15 and spent virtually his entire adult life at war. He never married nor did he have children. When he died, there was uncertainty about who had the rightful claim to the throne. Charles’s sister Ulrika claimed that she was the rightful heiress since she was the closest living relative. Ultimately, the Swedish Riksdag agreed to recognize Ulrika in exchange for eliminating the absolute monarchy and setting up a parliamentary system. In this new system, the political power was concentrated in the Riksdag. The period from 1721 – 1772 is therefore known as “Frihetstiden”, or the Age of Freedom. During the Age of Freedom, the Riksdag was dominated by two political parties that were referred to as the Hats and the Caps. The Hats controlled power for nearly 30 years beginning in 1738 and were mercantilists (their motto was “Svensker man i svensk drakt”, or “Swedish men in Swedish clothes”). In 1739, The Hats used the Swedish central bank, the Riksens Standers Bank (what is now known as the Riksbank), to give loans to private industry. These loans were funded with the creation of bank notes. In addition, the Hats started an ill-fated war with the Russians over parts of Finland. During this time, Sweden was effectively on a copper standard, but the expansion of bank notes for the provision of private lending and the use of the bank to finance the war ultimately led to the suspension of convertibility into copper in 1745. The increase in the provision of private credit by the central bank continued. In the 1750s, Sweden entered the Seven Years War to fight alongside their French allies. Sweden was particularly involved in the Pomeranian War with Prussia over land that they had lost in the Great Northern War under Charles XII (discussed above). The Hats were hesitant to levy any new taxes to pay for the war because to do so would require calling the Riksdag and therefore divulging the state’s budget. As a result, loans to the Crown increased substantially during the war and the supply of bank notes increased correspondingly. The Hats seemed to view the money supply as a limiting factor in development. They thought that an increase in the money supply would increase aggregate demand, which would encourage greater production and entrepreneurship. Increases in the money supply could apparently have a permanent effect on output. The opposition party, the Caps, countered that this increase the supply of bank notes was excessive and that the excess supply of money was causing rising prices and a depreciation of the exchange rate. By 1765, the public voted the Caps into power and the Hats become the main opposition party. Upon taking power the Caps decided to decrease the money supply in order to restore the price level and the exchange rate to what it had been prior to this expansion. What followed was a major decline in the supply of bank notes and a very costly deflation. The deflation was so costly that it pushed the Caps out of power and returned the Hats to power. Ultimately, a coup ended the parliamentary system and restored the monarchy. Shortly thereafter, Sweden adopted a silver standard. So why give you all of this history? The reason is that this series of events represents a sort of quasi-natural experiment regarding monetary policy. The Hats engaged in a deliberate increase in the money supply to increase economic activity and finance a war. What followed were significantly higher prices and a depreciation of the exchange rate. The increase in the money supply can be considered exogenous in the sense that the change in the money supply was brought about through deliberate policies by the Hats and is therefore immune to claims that higher prices were causing an increase in the supply of bank notes. The subsequent reduction of the money supply by the Caps brought about a significant deflation. Again, this was a deliberate attempt by the Caps to reduce the money supply and is therefore immune to claims of reverse causation. As Johan Myhrman notes “it is almost like a controlled experiment.” Below is a line graph of the monetary base and the price level during the period in question (the source is Riksbank historical statistics). I have also plotted the best linear fit of the data. As shown in the figure, there is a standard quantity theoretic interpretation of the data. Given the quasi-experimental nature of the period, this would seem to provide strong evidence in favor of the quantity theory of money under an inconvertible paper money.